Years ago, I saw a movie called Ladies in Lavender directed by Charles Dance. Starring Judi Dench and Maggie Smith, it’s the story of a gifted Polish violinist, a ship, a shipwreck and the two women who nurse him back to health when he washes up near their Cornwall home. I have followed Joshua ever since. Like I wrote last week about Robert Spano, I am in awe of the depth and breadth of Joshua’s talent. There’s something so beautiful and pure about what he does and how he does it. I see him every time he comes to Atlanta, including his performance at the pre-season opening concert last month with the Atlanta Symphony Orchestra. It was an all-Tchaikovsky performance: Robert did six pieces from The Nutcracker, plus Romeo and Juliet Overture-Fantasy. After the intermission the symphony returned to the stage, Robert came in and welcomed Joshua. His performance was Tchaikovsky’s Violin Concerto No. 1 — and it was breathtaking. Everyone was on their feet with bravos and applause. This is one of the many things I love about him. He understands how to play serious but also how to play and have fun. My friends Phyllis and Lynn, who knew the whole history of Ladies in Lavender, reached for me. They knew. And I thought, oh my God, he’s going to play it again. “I saw it!” I yelled out. But now, during this performance with the symphony, I gasped (because one does not yell out during an ASO performance). I’ve listened to that CD weekly since 2004. It is my soul song — I know it note by note. And to see him perform it live? Not once but twice? And with one of the greatest maestros and greatest symphonies in the world? He played it again. And I cried. Music transforms us. It re-alters the vibrations in our body and the best musicians know that. Robert knows it. Joshua knows it. And they play in hopes that someone else gets it, too. By the grace of God, I got to sit there and listen to it live. To say that it was a life moment is an understatement. If it ended there, right there, that’s all I needed. But there was more. Because Lynn is a Symphony board member, the three of us were invited to a party in the Robert Shaw room, named for the man who made the ASO what it is. I went in and positioned myself and thought, I’m just going to stand here. I don’t have to talk to him. I’m not going to bother him. That’s about me, of course. Joshua is so accessible: During intermissions he goes out and signs CDs in the foyer. It’s unbelievable and says a lot about his character. He knows he’s an instrument for divine music and he’s unbelievably gracious about it. Joshua came in with his Stradivarius strapped across his chest, probably because it’s worth millions of dollars. “You’re going to talk to him,” Phyllis said to me. “No, I don’t do that,” I replied. “Marie, if you don’t do this, you will regret it for the rest of your life,” she said. He was expressing regret for choosing it again. “Trust me,” I told him, “this is a completely different audience. Thank you for playing one of my favorite songs of all time. It was just as beautiful tonight as it was when you played it this summer. It’s the song that made me fall in love with your work. And the next thing I knew, someone came up and asked if they could get a photo of all of us together. 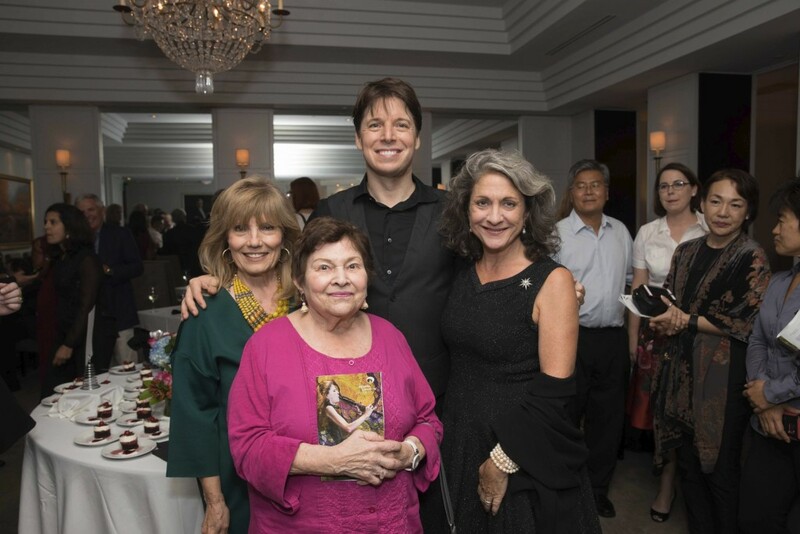 And there I was, taking a photo with Joshua Bell. And when it was over I thanked him again, then turned to Lynn and Phyllis and thanked my spirit sisters for opening doors, pushing me through them and helping my dreams become reality.